Why o Why did I not rinse out that wine glass last night! I found a nice little caravan of black ants this morning in the kitchen- another sign at our home spring is here! 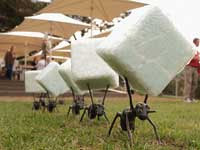 You can be lazy and buy Terro ant bait ( non toxic) or build your own! I found this on the net awhile back and it works great if you are in the DIY mood. In a bowl, mix the borax and sugar. Place a loose wad of toilet paper into each of four different screw-top jars. Pour a quarter of the sugar and borax mixture into each of the four jars, over the toilet paper. Fill each jar with water to one inch of the top. Screw the lids on the jars, and with a hammer and nail, make four to eight holes in the lid. Place the jars in areas where you have ants (but keep away from pets and children). Caution: Keep borax products away from pets and other animals. It is non toxic but an irritant! There are also a number of herbs such as mint and pennyroyal, and spices such as cayenne pepper, that repel ants.